Seedheads are starting to appear in big numbers in lawns this week This is a normal occurrence that happens every May across Michigan. 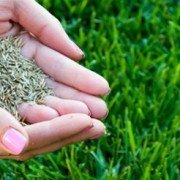 Most of the common turfgrasses found in lawns produce seedheads including Kentucky bluegrass, perennial ryegrass and of course Poa annua (otherwise known as annual bluegrass). Seedheads not only detract from the appearance of the turf but the seed stalks are tough to mow so make sure you have a sharp mower blade. However, even with a sharp blade you still may see a sheen or whitish look to the turf after mowing due to the seed stalks. Resist the urge to try and mow down the seedheads by lowering the mowing height. 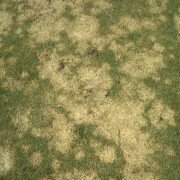 Any golfers out there will tell you that Poa annua can produce seedheads at putting green mowing height so lowering the mowing height on the lawn is not a recommended approach. Some things to watch for over the next couple of weeks as the seedheads hit peak. The turf may start to look stemy and lose density. This is natural. It will come back strong once this period of seedhead production ends. Basically right now the plant is putting a lot of energy into popping those seedheads. Once it’s done, the turf growth and density should return to normal levels. Also check out this great video from the Lawn Nut! 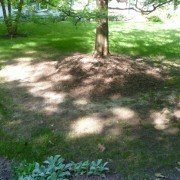 Moss is a nuisance in a lawn and people often want to know how to get rid of it. 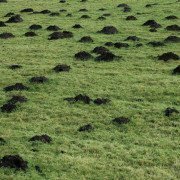 However, before you control your moss, it’s important to understand why it is present. 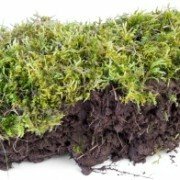 Moss loves shade, moisture, and poorly drained or compacted soil. 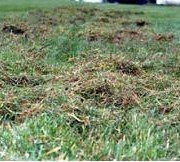 It will tend to creep into areas where grass has weakened and cannot grow. The moss is simply filling a void. Moss does not kill existing grass, it simply grows where grass cannot. Trimming trees– This will allow more sunlight to get to the lawn. Grass needs 3-4 hours of direct sunlight or 6-8 hours of filtered sunlight in order to grow. Trimming trees allows more sunlight in and will allow more varieties of grass to grow. 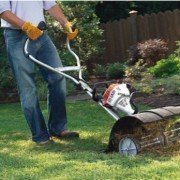 Trimming trees also promotes air movement and helps the grass to dry out. Tree Removal- This is a drastic step, but can make a big impact in growing grass and discouraging moss. Water Management– To reduce extra water, try “capping” sprinkler heads, changing nozzles, or reducing sprinkler time. 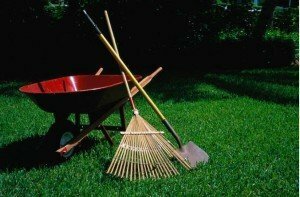 Also, be aware of your lawn’s drainage pattern and areas that may be accumulating water. Mowing Height– Mowing the grass between 3 and 3.5 inches tall is healthiest your the lawn. This allows deep rooting of the grass and the maximum surface area to absorb sunlight. 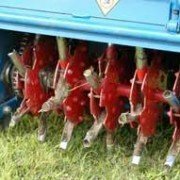 Aeration- This removes cores of soil and allows air movement, helps drainage, and relieves soil compaction. You don’t need to make a trip to your local lawn and garden center to control moss. There are two common household products that will help control moss. Ultra Dawn or Ivory liquid dish soap- Mix 2 to 4 ounces of dish soap with 1 gallon of water. Spray the mixture with a spray bottle or use a watering can. Apply when the grass is moist. Baking Soda- A few applications of baking soda will control moss. Add 2 to 3 tablespoons of baking soda per quart of water and spray on a warm, sunny day. In most cases, one or two applications will provide complete control. Baking Soda also works well to control moss on wood decks and brick patios. Both of these methods will turn the moss into a yellow / orange color and cause it to dry up. Keep in mind that killing moss is only a temporary solution. If you want to remove moss permanently, you must correct the shady and wet conditions that are causing the moss. 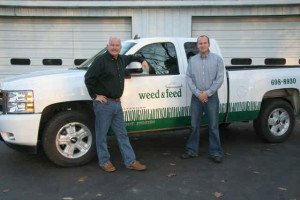 Each spring, we receive questions regarding an ugly, wide-bladed grass growing in lawns. 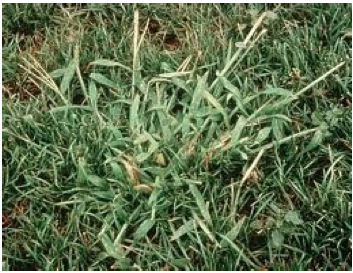 Customers are mistakenly identifying this grass as crabgrass. It is a easy mistake to make because they look so similar, but this ugly grass is actually quackgrass, not crabgrass. Quackgrass is a perennial grass that is one of the first grasses to come out of dormancy each spring. 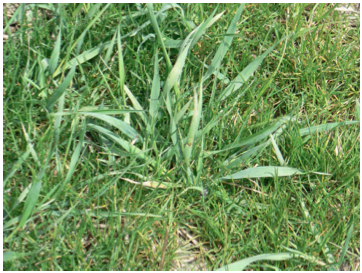 Many homeowners confuse this thick-bladed “junk grass” with crabgrass. Quackgrass has a huge root system so pulling it out is not a long term solution. 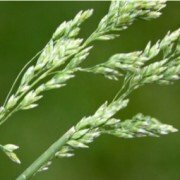 Because quackgrass is a variety of grass, there aren’t chemical products available that know the difference between quack- grass and the other good varieties of grass in the lawn. Round-Up is good at controlling quackgrass, but applying it will also kill desirable grass around it. We have heard of customers who have applied Round-Up in an interesting way. They will put a rubber glove on their hand with a cotton glove over the rubber glove. Then dip the gloved hand into Round-Up, and coat the quackgrass blades with the liquid. The Round-Up kills quackgrass roots and all in about 10 days. Crabgrass is a summer annual. It is similar in ap- pearance to quackgrass because it grows in clumps and faster than the grass around it. It germinates in mid-May and starts appearing in lawns in July. 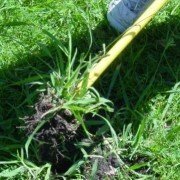 Our first lawn care application includes a crabgrass pre- venter which is our best defense against this un- sightly grass. The second best thing to help prevent crabgrass is a high mowing height. 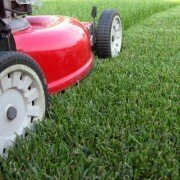 We see less crabgrass in lawns that are mowed between 3 and 3.5 inches than lawns mowed below 3 inches.